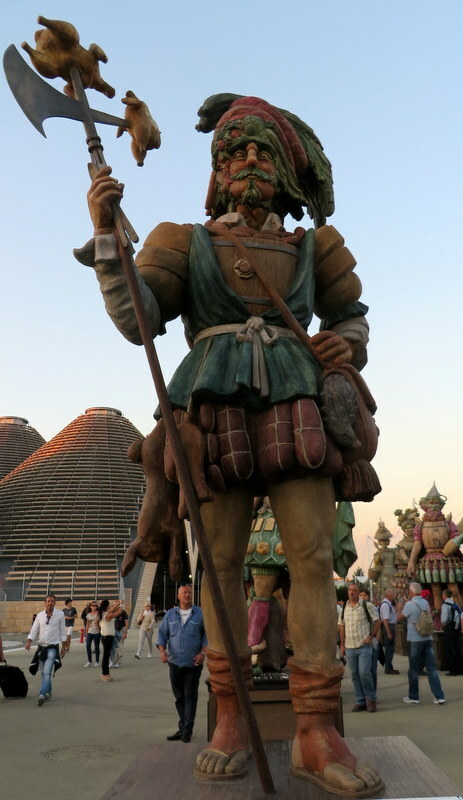 On our way to EXPO Milano 2015 on Monday, Ric quipped that he thought it might be kind of like a state fair, “but without the cotton candy.” He was right on one count; however, it was not anything like a state fair. It was more like a trade show, but for countries instead of industry, although I guess countries are an industry of a sort. 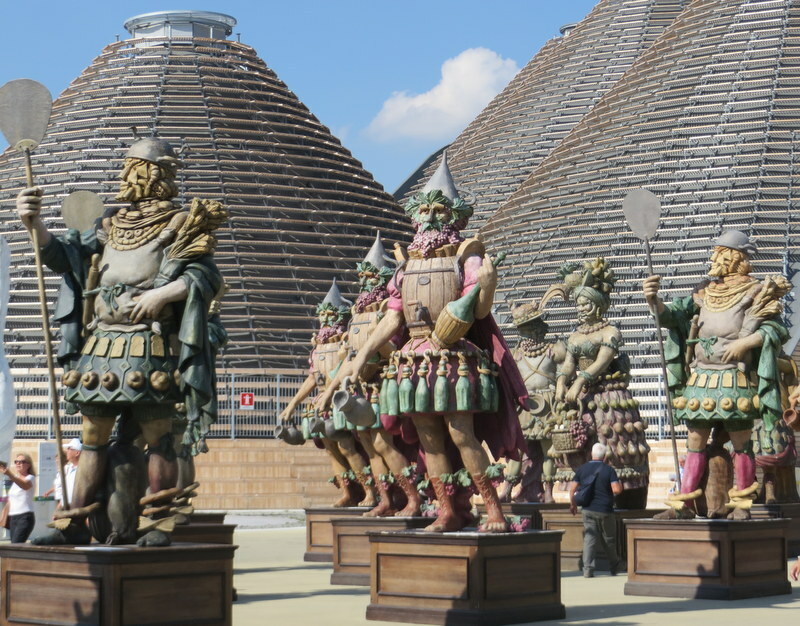 At the entrance to EXPO, Ric thought these looked like invading hoards…. 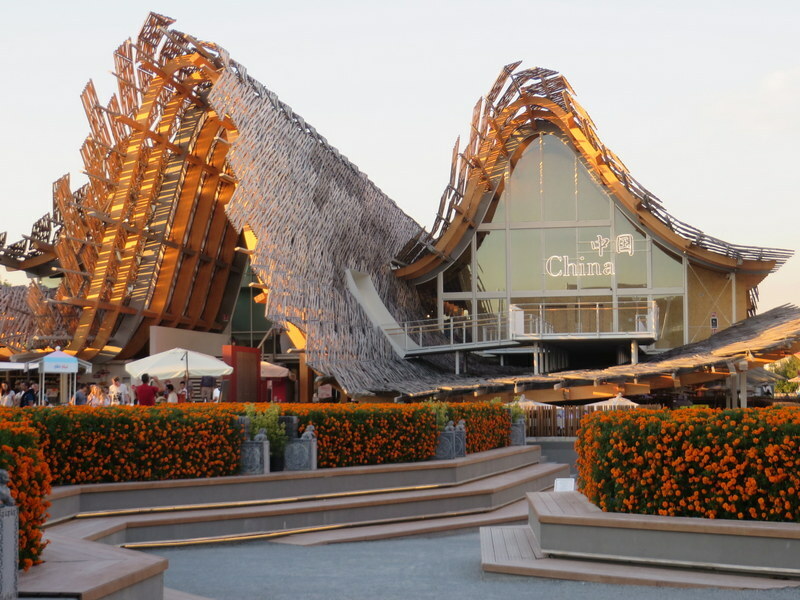 The theme at EXPO is “Feeding the Planet, Energy for Life.” In other words, Food Glorious Food! Some to eat, some to look at, apparently educational and thought-provoking displays and programs about the problems of nutrition and the resources of our planet. Except we couldn’t get into very many of the pavilions and see for ourselves. The lines were beyond the patience of any sane person. They would have had to be giving away gold nuggets for me to stand in line for 2 or more hours to see what any country had to say about the topic. United Arab Emirates — 2 hours. Japan — 3 hours. France, Russia, China, Oman, Slovenia, Slovakia all overwhelmed with ridiculous lines and no Disneyworld attempts to entertain the queue. 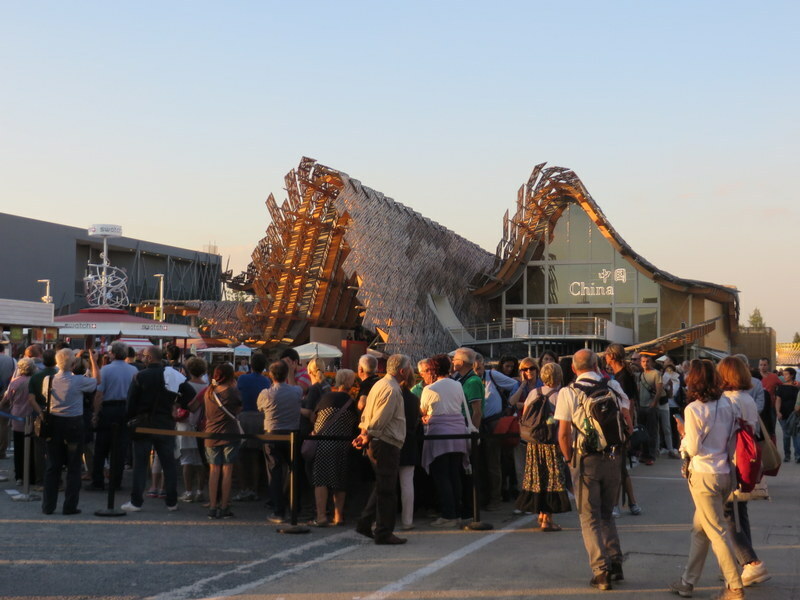 The Italian pavilion’s line must have been at least 100 meters long. Good thing it was shaded in the afternoon. At the Hungarian pavilion we were able to go in as there were two lines: one slow one for those who wished to do a water tasting and the other a non-line for those who chose to skip the privilege. We skipped the water tasting, but as we walked past it seemed the “tasters” were getting a little cup of water out of a dispenser set in a pretty wall. Yummy. The building is supposed to reflect Noah’s Ark, but looked rather like a large water barrel. The main floor displayed Hungarian crafts and had a stage and seating. We decided not to shuffle through all three floors with the slow-moving throng. Yawn. 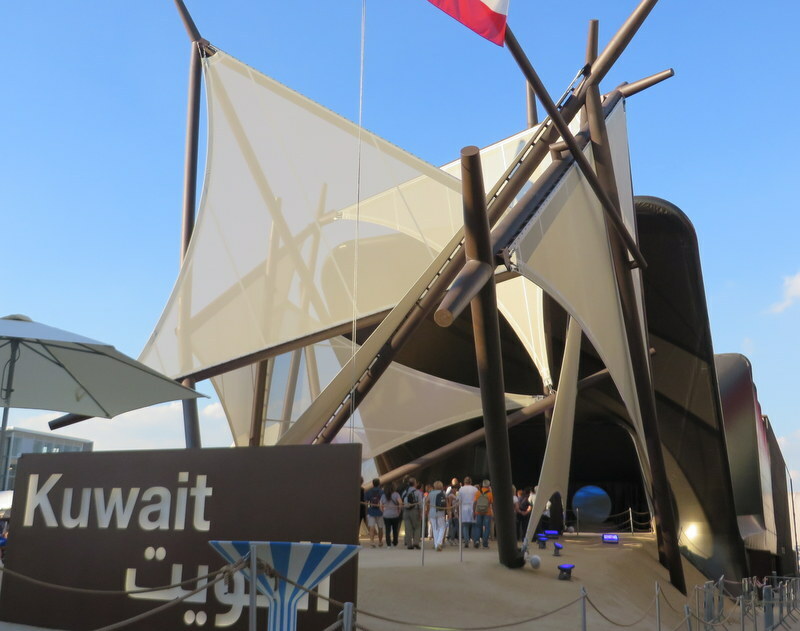 Kuwait looked like desert tents. Long entry line here, too. The small countries are in clusters such as Rice, Arid Zones, Coffee, Chocolate & Cocoa, Islands, Sea and Food, and so on. This allowed smaller nations (like Palestine, San Marino, Senegal, Afghanistan, Haiti, Congo, and dozens more) to have a presence without spending the capital the larger nations did. These were uncrowded when we visited late in the afternoon on a weekday. They amounted to little displays about food technology and traditions in the country with some regional cuisine served in a few of them. Palestine showed lots of religious items (Christian) for sale that were carved from olive wood, and sold hummus and other Middle Eastern specialties. In the African pavilions one would see people in colorful costumes, some playing instruments. No one seemed to want to engage visitors. I suspect by now, near the end of the fifth month of EXPO, the employees/hosts/volunteers are weary of the crowds. The Arid Zones cluster. Inside were small rooms for each country. We have seldom been to something so crowded. Disneyland was a piece of cake. The worst line at Disneyworld never took more than 45 minutes when we were there, and that was rare long wait. The Minnesota State Fair I used to attend was highly accessible by comparison, and they had a cow made out of butter. No butter cows at EXPO, but there were displays in the main street of plastic produce, cheeses, fish and meat. Why? Just to fill the space I think. They did nothing to create atmosphere nor inform. I found the giant pigs (plastic or resin?) 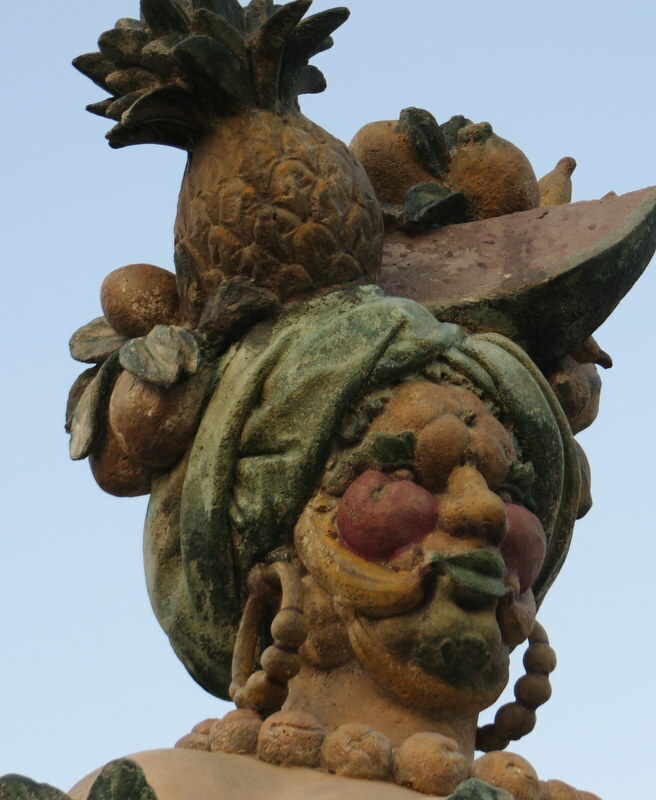 rather grotesque. Most of the restaurants sponsored by the countries were tough to get into. In many cases you had to enter the pavilion in the long line if you wanted to try to eat in that country. 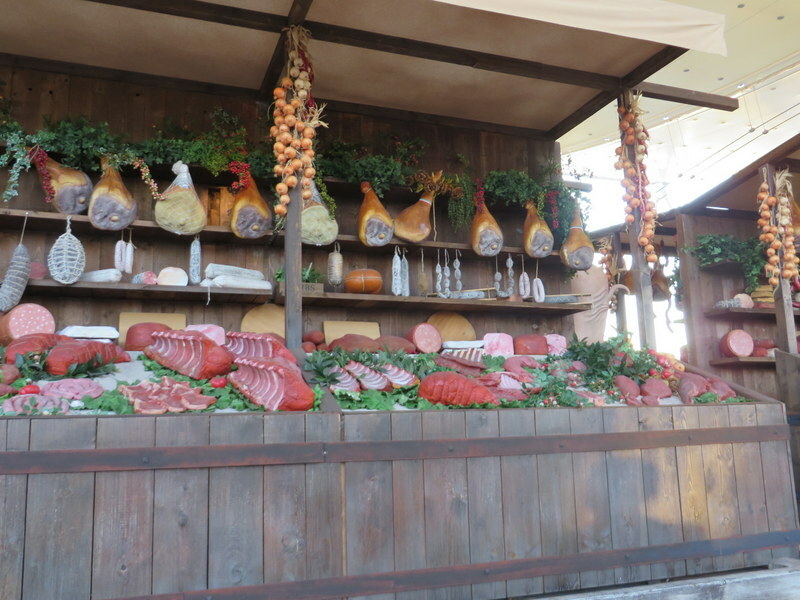 There were some cafès outside as well, but much of the food offered by concessionaires was Italian. 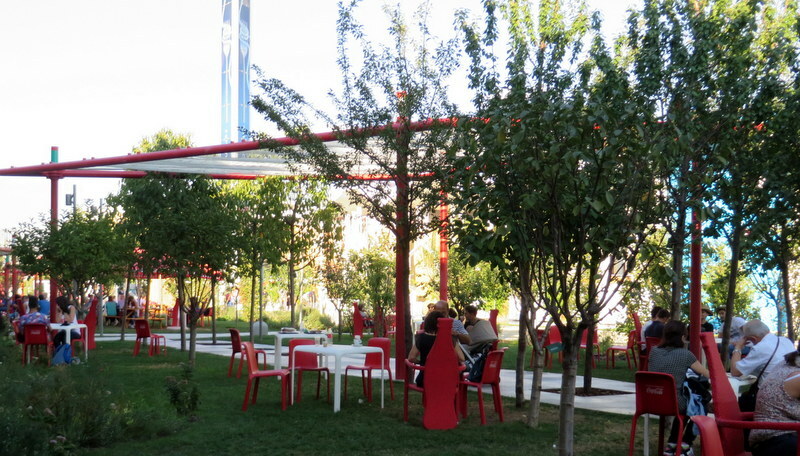 Sure, we’re in Italy, but the USA pavilion cafe served insalata caprese inside? 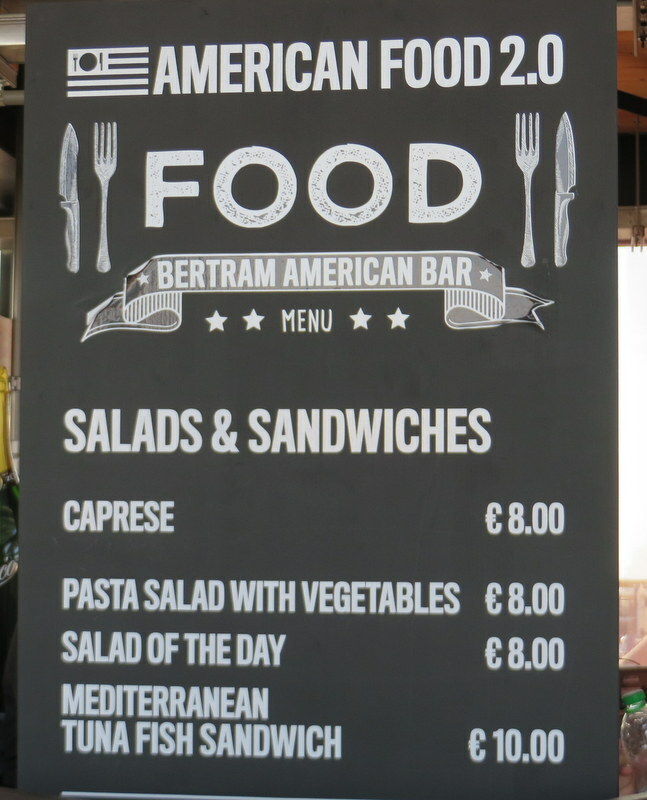 American cafe menu. I kid you not! Outside, the USA pavilion had a water wall that changed pattern every few seconds. The USA pavilion had a number of interactive displays about food production. They looked a little like pinball machines with screens. Food Truck Nation. 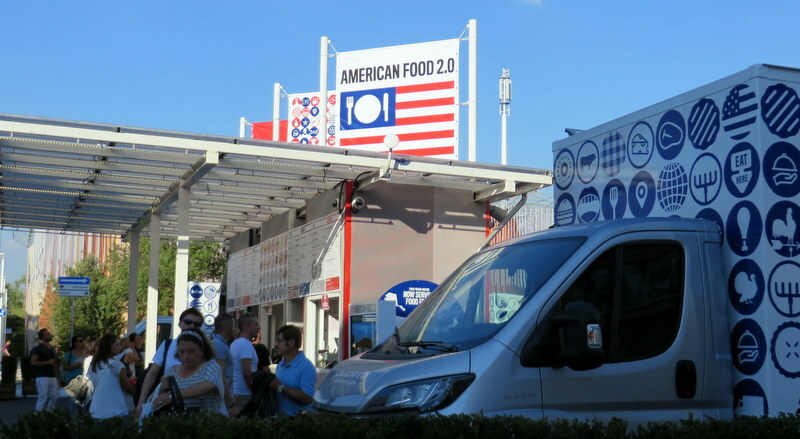 Yup, American food sold from trucks. Pretty good idea, we thought! There were exceptions. The Czech Republic was in permanent happy hour and they had easy access to beer every time we passed by between 3:00pm and 5:00pm. 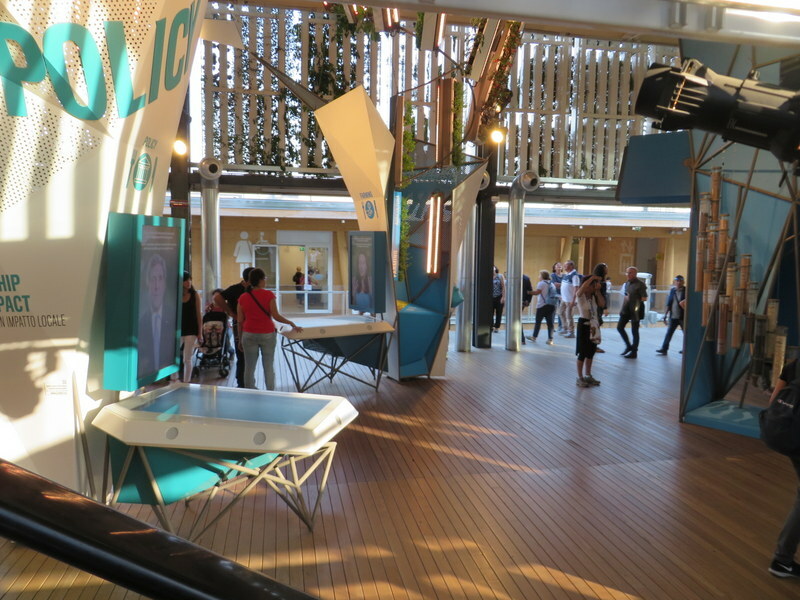 The USA pavilion had no line and some hands-on stations that were engaging for young people. It was kind of like a science museum in that respect. The Tree of Life “show” is cute — music, dancing fountains, a tree that blooms before your eyes — and on a nice open space where the crowd can gather and not overwhelm. Tree of Life in full bloom, after the show. EXPO worked from a logistical standpoint even if the lines were long. There are plenty of bathrooms, great rest areas for the weary, and well-planned shade for the main thoroughfare. There are plenty of workers/hosts/volunteers to provide info. Everyone seemed to speak English at a minimum, and lots of French as well. Signage and way-finding are excellent. It is clean and there was almost no smoking. Security is top-notch and entry was easy, at least at 3:00pm. 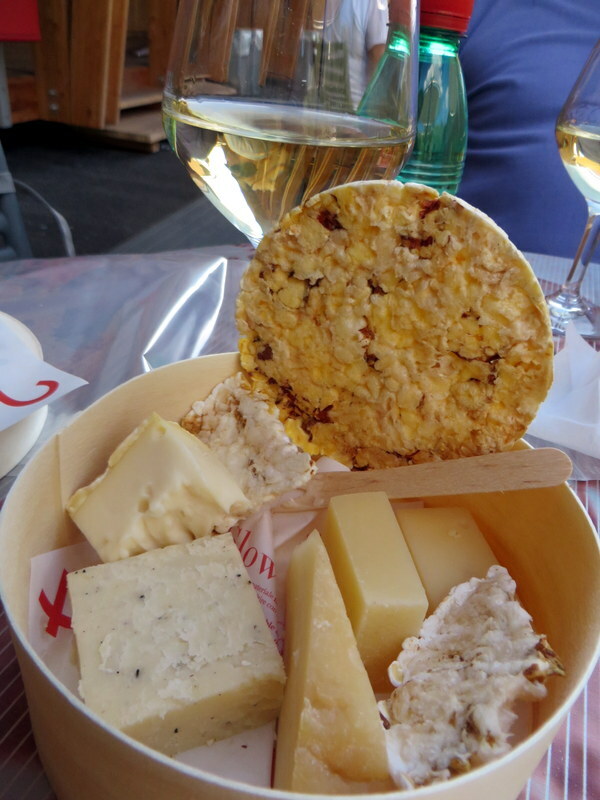 The Slow Food pavilion featured a snack of organic cheeses, corn crackers, and an Abruzzese wine called Passerina, of which we are now fans. Rest areas were plentiful. If you wanted to sit down, you could. Why the pavilion entrance times take so long, I cannot guess. What people found inside the Japanese pavilion I was unable to discover for myself, being unwilling to pay the price of a 3-hour wait. Maybe they were giving away gold nuggets. 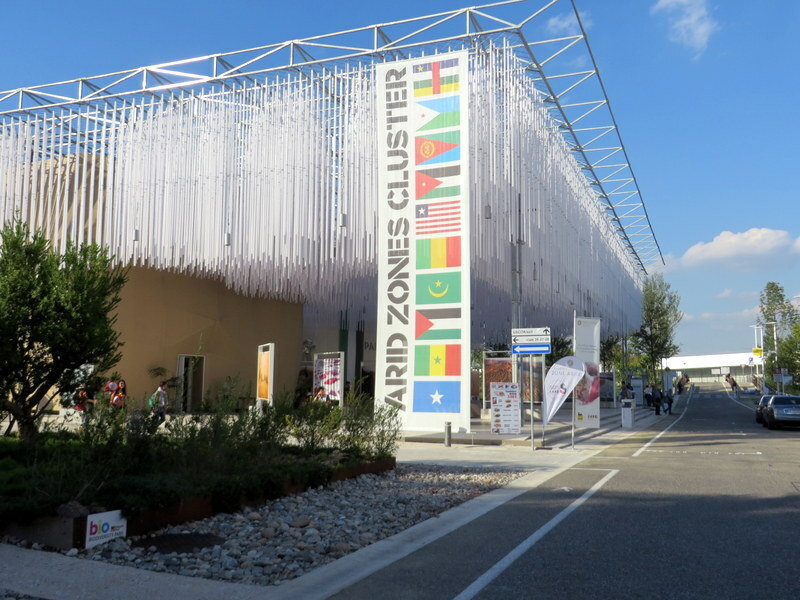 If you planned to spend 8 hours at EXPO, you could visit perhaps 3 or 4 of the big countries. That’s not a great return-on-investment of time. It is an enormous property and we logged about 10km during our visit. 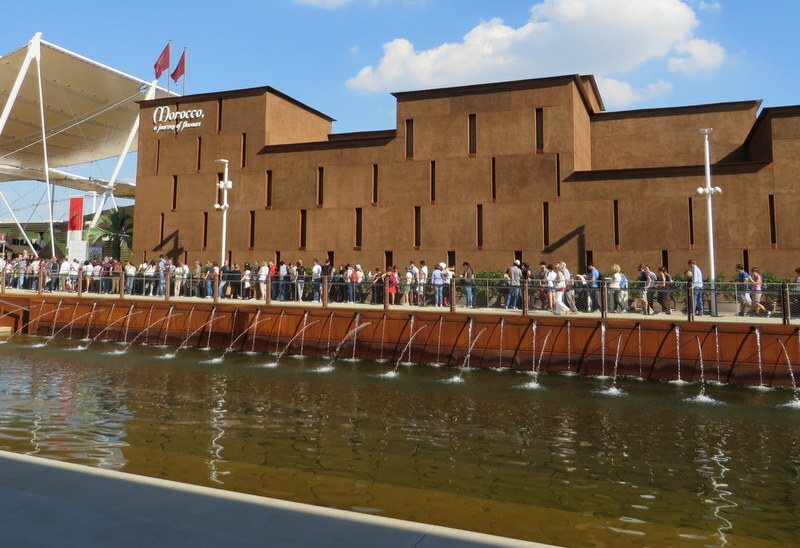 The Moroccan pavilion has a favorable spot alongside a canal and rest area. But the queue was long and slow-moving. So I am not a fan. I an no doubt coming off as negative although I an trying to portray realism. I feel about EXPO the same way I felt about Croatia: I am glad we went, it was interesting, but I would not go back. The food was better in Croatia. At least there was no cotton candy at EXPO. I hate the stuff. 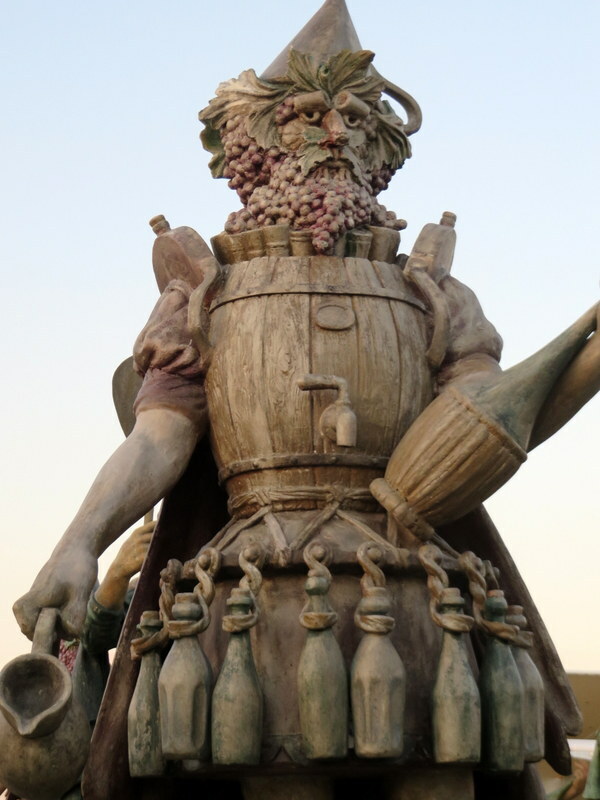 The “invading hoard” turned out to be a clever set of sculptures called “Food People.” Here is Mister Salami. My husband had the chance to purchase tickets at half off through his company, but we’ve been procrastinating due to all the horror stories about the lines! We’re planning to go first thing next Monday morning, but imagine that a zillion other people will be planning the same thing. Appreciate your post on this and I think I’ll probably just end up taking pictures of buildings more than anything else. No way am I standing in line for hours! It will be interesting to hear what your experience is, Rowena. We thought arrival in the afternoon would mean fewer people, but alas, no. Still I think it is worth a look around. Poke your head in at the “clusters” and you may be surprised. It is an interesting site! We were thinking of going to the expo, then decided to pass on it. . glad you made the trip for us!! Happy to help! Spend your travel time in lines that matter. They will all be shorter, I assure you! 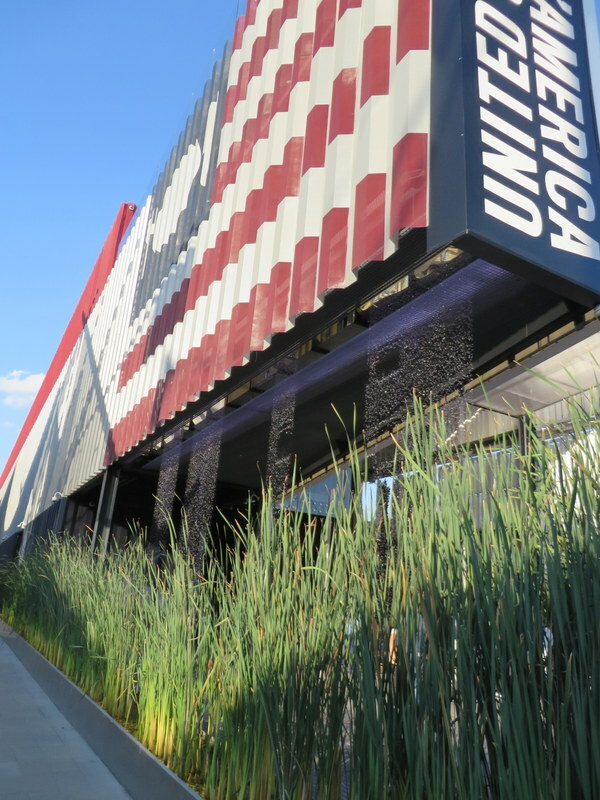 The American Food Truck Nation had burger, hotdogs, BBQ and more. But the restaurtant inside was not offering what one might expect. “Mediterranean Tuna Sandwich?” Geesh, maybe PB&J, grilled cheese, or Virginia ham would have been more representational. I have one EXPO-related event I have yet to write about and it was fabulous. Stay tuned! I would not have waited in those lines either. Sort of like a World’s Fair (I have been to two of those). Good of you to make the effort though. Thanks for the insight so now I’m not jealous. I did expect more! We were kind of jazzed on arrival. The transportation to the site is excellent and entry easy if expensive. Rather disappointed to say the least. Perhaps someone else will be spared the pain if they read my opinion. Always taking one for the team! 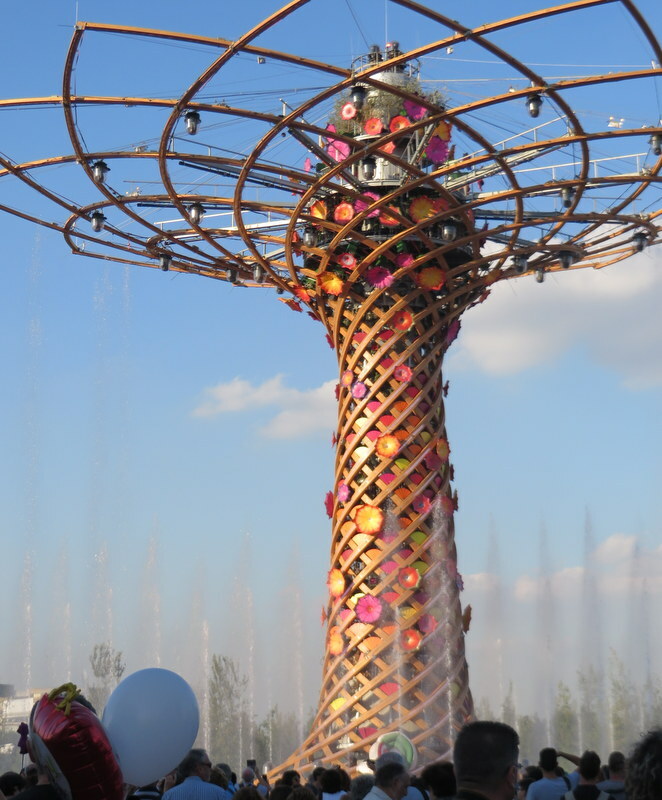 Perhaps the idea of a World’s Fair or EXPO has past and is no longer a “thing.” No longer do we have fairs that produce an Eiffel Tower or a Space Needle! Or introduce us to new thoughts and ideas from far away places. We have the internet for that now.